If you like the look of the Mazda3 but are craving a lot more performance, take a look at the 2011 Mazdaspeed3. The 2011 Mazda3 provides more driving enjoyment than most other small-car models, along with a stylish, racy look; but with a tight, noisy cabin, it’s not without compromise. The 2011 Mazda3 built its reputation around being fun to drive, and it looks the part, with fit, flamboyant styling in either sedan or hatchback models. The entry-level 2011 Mazda Mazda3 'i' is equipped with a 148-horsepower, 2.0-liter four-cylinder engine mated to either a five-speed manual or automatic transmission. 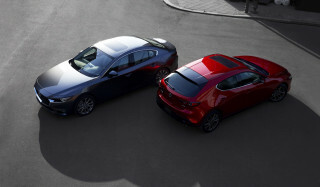 The sportier 's' models come with the 2.5-liter four-cylinder engine from the Mazda6 that pumps out 167 horsepower. The larger engine gets a six-speed manual transmission as standard and the same optional five-speed automatic as the base car. The base engine does a competent job of producing commute-worthy power, and with the five-speed automatic, it's reasonably swift for lane changes and highway passes. It does tend to boom and whir more than you might like, though. 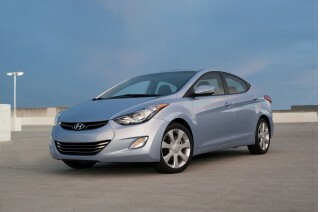 The 2.5-liter four is a much happier prospect for enthusiasts; it picks up nicely in most gears and feels more refined. No matter which model, handling is the Mazda3's key to delivering 'zoom-zoom' behind the wheel; the suspension tuning is athletic and firm, but compliant enough not to compromise ride comfort too much. The previous version was criticized for a stiff and noisy ride at times. The engineers seem to have made the new car more resilient, yet suspension and road noise sometimes overwhelms the cabin. That said, the interior is otherwise a pleasant place, with generous, supportive front seats and a reasonably accommodating back seat—plus a low, flat cargo floor with the seats folded down. Fuel economy is the only area where the Mazda3's decidedly mediocre: ratings of 25/33 mpg for the smaller engine with the manual gearbox to 22/29 mpg for the larger engine with the automatic are barely up to snuff for the class. Mazda continues to set the Mazda3 apart from other affordable compacts by offering features that are otherwise seen only on luxury-brand vehicles. The top-of-the-line 2011 Mazda3 Grand Touring includes bi-xenon adaptive lighting; a three-position memory function has been added to cars equipped with power seats; and features like rain-sensing wipers, a ten-speaker Bose surround-sound system, Bluetooth connectivity for cell phones and portable media players, a dock for iPods, and Sirius Satellite Radio are all on offer. 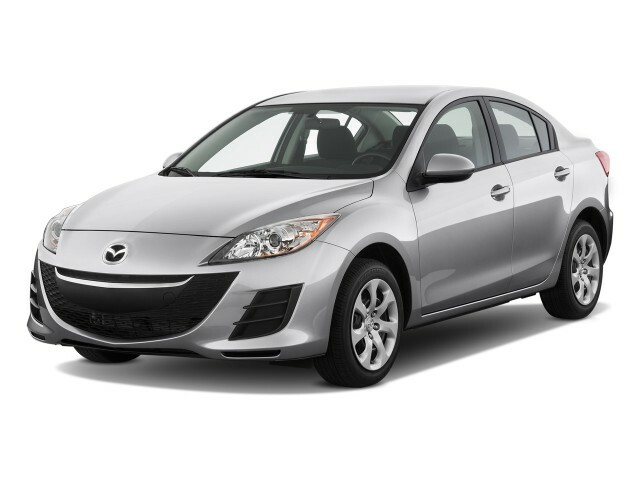 The 2011 Mazda3 is a very stylish car; and the hatchback is one of the more distinctive shapes in its class. The Mazda3 comes in two body styles: a five-door hatchback, and a (less expensive) four-door sedan. 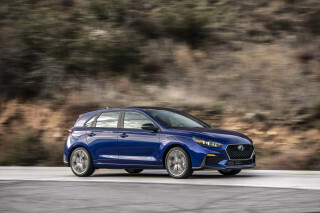 But we think the hatch is the way to go, as it's by far the better-looking and more expressive of the two; the sedan is respectably styled, if a bit frumpy. All Mazda3 models were completely redesigned last year and got an amped-up personality—with more expressive sheetmetal, a new front-end appearance, and a smoother, more upgraded interior feel. The flared fenders and character lines of the 2011 Mazda3 altogether bring a more aggressive, distinctive look to the car, up close, but it was the front-end design that caught some criticism for looking a little too much like a wide-mouthed grin. That's the new five-point grille that is the new "global face" of Mazda. Otherwise there's a lot to like in the rest of the design, which is neat and tidy—it's a handsome, upscale look with some sportscar wedge to its profile. Inside, the cockpit is more sophisticated and plusher than before, with refined curves and expansive pieces of black and toned plastic, some of which looks less pleasing than other bits. It's a common refrain: carmakers have to balance out look and feel with the cost of the cabin, and the Mazda3 balances the two better than most, but some color choices accent the grainier plastics. The new interior look that was introduced last year in the Mazda3 is also a little smoother and classier in shape than the previous layout—incorporating a sloped center stack and, atop the middle of the dash, one screen for a trip computer (or nav system on upper trims) and one for the climate control. For driving excitement in an economical compact car, the 2011 Mazda3 is tough to top. There isn't much of a difference in performance—or many other vivid distinctions—between the two four-cylinder engines that are offered on the 2011 Mazda3 is offered with one of two different four-cylinder engines, and there isn't that much of a difference between the two, but the hatchback is only offered with the larger of the two. 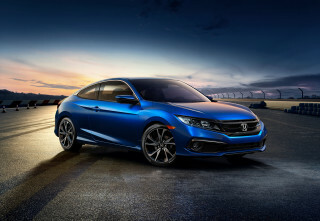 The 167-hp, 2.5-liter four-cylinder engine has a nice, robust torque curve; just off idle, it builds steadily and feels at its most responsive in the 2,500-rpm to 4,500-rpm range—where it's going to be for most driving. Though it's down 19 horsepower from the 167-hp, 2.5-liter four, the smaller four's 148 horses aren't too overworked in keeping up with typical freeway traffic and delivering 24/33 mpg fuel economy. With either of the engines, you get a touchy, aggressively calibrated throttle pedal that comes across as gimmicky, making the Mazda3 initially feel more macho than it is. In either of its forms, the Mazda3 feels best engaged from about 45 mph to 75 mph, the perfect working powerband for commuter traffic. Of course, the manual gearbox is a more entertaining partner—with a nice, short linkage and straightforward clutch engagement. The automatic shifter's sport-shift mode feels like a manual lever in size and action, and brightens the driving feel a bit. 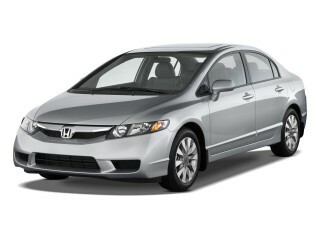 Unlike in other small-car models, the automatic isn't such a penalty box; it's quite responsive and livable. What the Mazda3 does well is handling. In that respect, it's a shining star. Find a little narrow, rough backroad and the Mazda3 is a riot to drive; the suspension feels way more sophisticated than you might expect in a budget hatch, and it doesn't succumb to plowing and understeer at the slightest provocation. And if you hit some mid-corner bumps, the suspension then smartly soaks it up rather than hopping. It's very well-tuned, firm, but not too hard, and the steering is about perfect—never overboosted and with good feedback in tight corners. The 2011 Mazda3's form and function bring plenty of space and versatility to go with its good looks, but the execution's a little lacking up close, with lots of cabin noise and some slightly disappointing materials. There's plenty of legroom in front, but there's one caution for taller folks: with a sunroof, the Mazda3 has compromised headroom that might get in the way for anyone over six feet or so. In back, the accommodations aren't bad at all for a little hatchback; headroom is just adequate for six-footers, while legroom is a bit tight. Fold the backseats down, and they form a low, flat floor large enough in hatchbacks to swallow a small piece of furniture. Front seats in the 2011 Mazda Mazda3 are more generously sized—with longer cushions—than most in this class, and the available leather buckets are especially nice, with high side bolsters. Take an up-close look around the interior, and the execution starts to fall apart a bit in the details. The nice hooded gauges are great, and with the fat, small-diameter steering wheel give the 3 a little bit of sports-car feel. Readouts for the audio and climate controls are up high, however changing the climate controls still involves looking far downward; furthermore, the readouts, with one trip-computer screen and another climate-control screen—one in a grey-white and the other in an orange-red, with completely different fonts—leaves something to be desired, aesthetically and functionally. And plastics? Well, they could be better all around. One of its most significant drawbacks to the Mazda3 is cabin noise. Provided you're cruising you won't hear the engine much, but you'll hear tire noise and road coarseness at all times on the highway unless you have the sound system turned up. Two other recommendations can be avoided by selecting (or not selecting) particular options. Number one: Don't get the sunroof if you're tall, as it cuts severely into available headroom, in a car where it's already borderline tight. Number two: Avoid the lighter-colored interiors; they're the sort that nobody outside the luxury realm does well, and here they serve to emphasize differences in tint and graining. Plus it would be hard to keep clean. 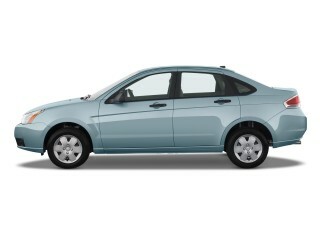 The 2011 Mazda3 isn't missing any equipment with regard to safety, and its ratings have been quite good. The 2011 Mazda3 isn't missing any safety features; beginning last year, all models (even the base Mazda3 SV) included electronic stability control, anti-lock brakes, front side airbags, and side-curtain bags. Active head restraints are also included. And for those who would rather avoid accidents in the first place, strong four-wheel disc brakes are included in all Mazda3 models. Crash-test results have been very good but not quite at the top of the class. The federal government, under last year's less-stringent testing, rated the 2010 Mazda3 five stars for frontal impact and four and five stars for side impact. New 2011 ratings for the model aren't yet out. The insurance-funded IIHS has given the Mazda3 its top 'good' rating in frontal offset and side tests, but it hasn't yet tested the model for roof crush. With great connectivity and entertainment features, along with some extras that aren't usually seen outside luxury brands, there's no reason to be disappointed with the feature set in the 2011 Mazda3. Mazda has built quite a reputation lately for offering high-end features in price ranges that typically don't see many luxury items. The 2011 Mazda3 carries on that tradition with a wide selection of standard and optional features spread across the trims that should appease almost any sport compact customer, though some options aren't available on all trims. Base Mazda3 SV and Sport models are close kin to the pricier Grand Touring models, though the difference comes in options: Some option packages offered on 2.5-liter versions aren't even found on the checklist. But tech-savvy shoppers will be kept happy with Bluetooth standard on most models, along with steering-wheel audio and phone controls. A Bose Centerpoint audio system packaged with the moonroof came also with Sirius satellite radio, making this an ideal version for the commuter who needs to be entertained and productive. The options boosted the price from $18,350 (plus $570 destination) to $21,045. The available Bose Centerpoint system sounds excellent, too—just right and not too bass-heavy. 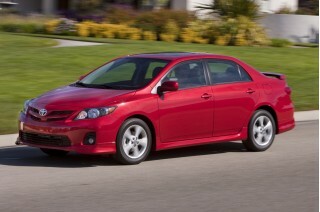 Even in its top Grand Touring trim, we think the 2011 Mazda3 is a strong value. The Mazda3 Grand Touring includes bi-xenon headlamps, adaptive front lighting, fog lamps, a bright-tipped dual exhaust, rain-sensing wipers, heated mirrors, leather seats (heated in front), dual-zone climate control, a Bluetooth hands-free interface, and electronic stability control—all for about $23k. Add a new Tech Package, which includes items like rain-sensing wipers, adaptive bi-xenon headlights, and new rear LED combination taillamps, and you're still under $26k. Fuel economy is typically a major selling point for compact cars, but that isn't the case for the 2011 Mazda3. If there's one aspect that's a little disappointing, it's the 2011 Mazda3's fuel economy. 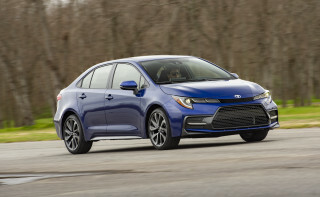 EPA fuel economy ratings range from just 21 mpg city, 29 highway with the larger 's' engine and manual transmission up to 24/33 with the smaller 'i' engine and automatic transmission. EPA ratings for a Mazda3 s Grand Touring tester with the 2.5-liter were just 22/29 mpg, and The Car Connection saw an average of just 25 mpg over a week and 200 miles--with more than half of that gentle highway driving. Whether it's the somewhat low gearing of the Mazda3, or its abrupt throttle, a car of this size and relatively light weight should be doing better.